Here they are! The meatballs of the hour – that are, actually, not meatballs. Because they are VEGETARIAN MEATBALLS! Made without beans (we’re going rogue!) and made instead with cauliflower and brown rice and quinoa. As much as I love a good MEAT-ball meatball from time to time, today we’re talking about these little vegetarian meatball nuggets of powerhouse nutrition that are inspired from the (here comes the weird zone) spicy cauliflower burgers I made and loved a few weeks ago. The breakdown is that they’re made with cauliflower, brown rice, quinoa, oat flour, eggs, and a nice big pinch of garlic and spices. And they don’t require hours of prep. That’s it! It’s just simple, straightforward, SUPER YUM plant-based goodness in the form of vegetarian meatballs made weeknight-dinner-friendly, because real food that matches real life is where it’s at. And don’t we know it, guys? DON’T WE KNOW IT. INGREDIENTS: Basic, whole, wonderful –> Cauliflower // Brown Rice // Quinoa // Garlic // Spices // Eggs // Oat Flour (which is nothing more than just old fashioned oats crushed in your food processor or blender). Also – no beans. Which is kind of nice, right? since a lot of vegetarian meatballs are bean-heavy. All hail the versatility of cauliflower! TIMING: 30 minutes. The cauliflower is not high maintenance here. 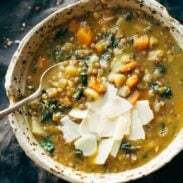 Just a quick simmer in some hot water to soften it up, and then as a bonus on being speedy, you can use those amazingly convenient garlic brown rice quinoa packages from Seeds of Change that you buy en masse at Costco – you know the ones, right? – and then your cauli and your rice and everything else gets pulsed around in our favorite appliance of all time THE FOOD PROCESSOR in order to make the mixture. If you can enlist the help of a few vegetarian meatball rollers (this is why people have children, right? ), you will have vegetarian meatball dinner on the table AND vegetarian meatball stockpile built up in your fridge in no time. ADAPTABILITY: Cook once, eat many times. This recipe makes a million and a half meatless meatballs which means that you can use them with many different sauces in many different recipes for years to come. Er, no. Not years. But seriously – you will have a TON of meatballs with this recipe, so start brainstorming serving and/or sauce ideas (and please let the record state that I strongly recommend LIFE CHANGING MASALA SAUCE). Yesterday I brought a freezer-ready bag of these to my sister since she just had a new baby, and I was feeling a little vulnerable about being the weird sister who brings non-meat meatballs as a food gift, but right away when she saw them, she declared them to be a perfect finger food for her two-year-old since he loves things he can hold and dip and nibble on at his own slow-eating pace. UM WHAT. As a non-mom, I didn’t even think of that genius, but how cute is the visual of your favorite two-year-old dipping a veggie meatball made with cauliflower and quinoa and brown rice into ketchup or marinara or ranch (not above it) or – for the foodie toddlers out there – a little spicy masala sauce? It’s like a chicken nugget meets veggie burger in kid-friendly size. I’m sure that someday, when Bjork and I have kids, they will be foodie kids who love to dip veggie nuggets in masala sauce, right? 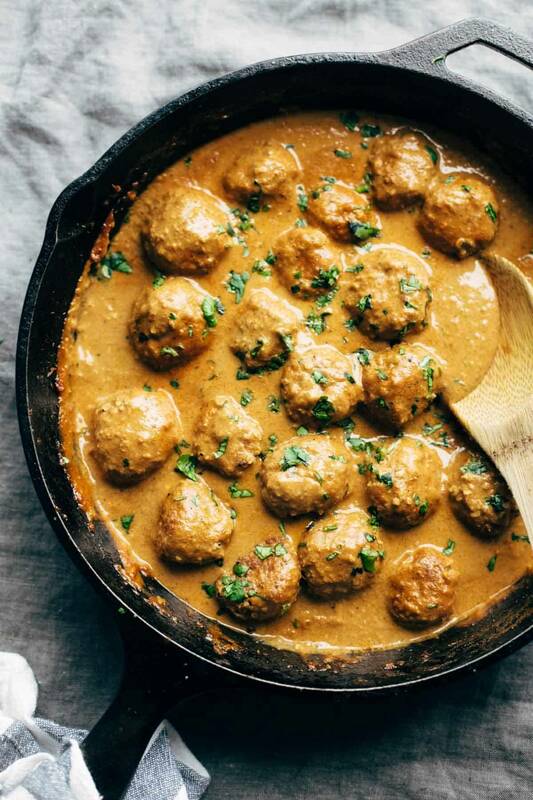 I cannot get enough of these vegetarian meatballs with a few gallons of the life-changing 30 minute masala sauce, but I’d be okay if you did just about anything with these. They are begging for some creative serving combinations and a good drench in a delicious sauce, and as we know, sauce is life. 30 Minute Vegetarian Meatballs – cauliflower, quinoa, brown rice, garlic, and spices. SUPER versatile – recipe makes a huge batch so you can stockpile them in your freezer for easy meals later! 3/4 cups of a “dry ingredient” like oat flour, almond meal, breadcrumbs, etc. Cauliflower: Cook the cauliflower florets in a pot of boiling water for about 5 minutes, till fork-tender. Drain well. Mix: Pulse the quinoa and cauliflower through a food processor until semi-smooth (see pictures for texture). Transfer mixture to a large mixing bowl and combine with all other ingredients. Stir until everything is incorporated. Roll into small balls (about one heaping tablespoon per ball was best for me). Cook: Heat a thin layer of olive oil in a skillet over medium heat – add the balls and cook for a few minutes on each side – they will need to be gently turned every so often to get browned all the way around. Serve with yummy sauces, salads, bowls, or freeze for later! I used Seeds of Change pre-cooked garlic brown rice and quinoa for this recipe (2 packets = about 3 cups). Since this has garlic flavor already in the mix, if you are using your own pre-cooked quinoa and/or brown rice, make sure to add some minced garlic or garlic powder. If the mixture doesn’t stick together in a ball when gently pressed, add about 1/3 of the mixture back into the food processor and pulse until it’s more the consistency of hummus. That should help it hold together. If that still isn’t enough, just add a little more of your “dry ingredient” till you get a consistency that you can gently roll between your hands to form ball shapes. Nutrition facts are for 1/12th of this recipe, so just take your total # of meatballs and divide them into 12 servings – the exact number of meatballs per serving depends on how big you make the meatballs. Just made these and they didn’t quiiiiiite end up looking like the picture. Since the mix is so soft, the balls ended up flattening out a little in the pan so they’re more like little patties. Also, the middle stayed very soft so I’m a little worried that they won’t stay together in the marsala sauce I’m planning to make. The taste is good, though! Hi, I am a vegan, can I sub vegan egg for the eggs tofu ? Hi Christine! We haven’t tried that so can’t say. Would love to hear how it goes! Looks soo tempting and yummy! I am really trying to find the “trick” to getting the texture of these veg-balls correct. So far I have had a very sticky batter BOTH times I have tried to make these. The first time, I used only quinoa with no brown rice. I ended up using a ton of flour (maybe 4 or 5 cups) to get it to a “rolling” consistency. Then, I attempted this a 2nd time, using the “Seeds of Change” mix. This helped a lot with the texture, but it was still very… sticky and I was not able to form neat little balls. Should the cauliflower AND the rice/quinoa mix be pulsed TOGETHER in the food processor or SEPARATELY? This seems like a minor detail, but I am thinking this, as well as letting the quinoa/rice and caulifower cool completely before processing, will help the texture a great deal. So I’m in the process of making these into italian meatballs instead. Using italian spices and parm rather than the cumin and such. Going to eat them with my home made spaghetti sauce. Sounds amazing! We’d love to hear how they turn out! Wow. Crunchy meat balls. My kids would love them. Worth a try. Nice article accompanied with lovely snaps. Thanks. Ahhhhh these seriously rocked my world. I love them and the masala sauce too. I made both for dinner last night, and I can’t wait to have leftovers tonight. Thank you so much for this one! I made these tonight. They taste AMAZING. But they fell apart a little in the pan. Would you suggest more bread crumbs? I also used Panko. Not sure if that makes a huge difference. Hi Laura! We recommend adding about ⅓ of the mixture back into the food processor and pulse until it’s more the consistency of hummus. That should help it hold together. If that still isn’t enough, just add a little more of your panko until you get a consistency that you can gently roll between your hands to form ball shapes. Can you recommend a substitution for the quinoa? Kinda crazy, but I’m allergic to it. Hey there. This looks amazing! Just one little ole question though….do you mean 1 tablespoon of each spice or 1 tablespoon of a mix of spices? Thank you. It’s 1 tablespoon of a mix! Great question! My first time with a food processor. These meat balls were awesome. Thanks. You’ve done it again. I’ve yet to make anything less than awesome from your site. This is me and my husbands to go recipe destination. These are delicious and my 18 month old loves them too! Thanks! We love hearing that! Glad you enjoyed them! What do you think I can substitute eggs for to create the vegan version of these meatless balls? They look delish!!!! Hi Mariana! Another reader used ground flax seed instead of eggs to make these vegan. For each egg, she used 1 Tbsp flax seed and 3 Tbsp water, so for the full recipe, 4 Tbsp flax seed and 3/4 cup water. 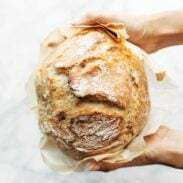 I just saw this link on Sheerluxe.com and can’t wait to get home to try your recipe! It looks delish! I just started cooking with quinoo. And I have been collecting recipes. This one sounds. Delish!!! Can you recommend an egg substitute to make this recipe vegan? Do you think flax eggs will work? Of course I see the flax egg recommendation after sending my comment! Duh! I made these last night and they were so good! I was really impressed because whenever I make “meat” balls they fall apart. I thought I’d give some feedback on what I did. First, I used one bag of Trader Joes frozen cauliflower rice, cooked in the microwave, it made the process way easier. For spices I did a teaspoon each of salt, garlic powder, paprika, cayenne, and chili powder. I only used 3 eggs. I used almond meal as the dry ingredient and everything stuck together great! They were a little difficult to flip in the pan since they’re squishy, but once they crisped up they were perfect little balls. However, as an experiment I put a few in the toaster oven at 375 to see how they would bake, and it turned out that baking them is much better. It formed an even crust over them allowing them to hold better in the sauce, plus it was less mess and time. I’ll bake them next time, but I will be making these again. Thanks!!! Thanks so much for the tips! Glad you enjoyed them! Can i get the recipe for the sauce too? Can these be made vegan? Hi Rachel! Another reader used flax seed eggs for this – for each egg, she used 1 Tbsp flax seed and 3 Tbsp water, so for the full recipe, 4 tbsp flax seed and 3/4 cup water. So first off, I love all the recipes I’ve tried from this site. This is the first recipe I’ve had to tweak a bit. I knew off the bat I was going to bake mine cause hot oil and I do not mix. I think using a blender made it a bit too mushy, the next time I make this I will blend the cauliflower and rice but not the quinoa to retain some texture. Other than having to add a bit more coconut flour and panko than the recipe calls for, this will be made again! Glad to hear it, Melanie!